Leading up to the start of the 2013 North American International Auto Show (NAIAS) in Detroit, Toyota teased the Furia Concept in tightly cropped teaser shots without the Corolla portion of the name; leaving many to wonder what the Furia might be. However, when this super sporty compact concept debuted earlier this week in Detroit with the Corolla name, it became very clear as to what Toyota aims to do with this styling compact sedan. There was a point in time when someone looking for the most reliable, the most efficient and the most affordable compact sedan in the US market would look to the Toyota Corolla to be their next new car but as the segment has grown rapidly over the past few years, the Corolla has seen its share of the segment dwindle a bit. Mind you, with 290,947 examples sold in 2012, the Toyota Corolla was still the 8th bestselling vehicle in America while being the 5th bestselling car and the 2nd bestselling option in the compact segment – trailing only the Honda Civic. However, new models like the Ford Focus, the Chevrolet Cruze, the Hyundai Elantra and the new Dodge Dart have launched with better performance, better fuel economy, more amenities inside and more engaging exterior looks that have allow them to overshadow the Corolla. In a segment where looking sporty has started to mean more and more to US buyers, the Corolla is unquestionably the least aggressive of the group but that is where the Furia Concept comes into play. There is no question that the new Toyota Corolla Furia Concept is a major leap in styling from the current Corolla but at the same time, we should keep in mind that there are obvious features of the Furia Concept that will almost certainly not be featured on the next generation Corolla. First off, all of that carbon fiber trim on the front fascia, along the sides of the car and around to the back end will not be present should the Furia Concept be transformed into a production level Corolla. All of that gloss carbon trim looks awesome – especially against the metallic orange body – but for a car that needs to be priced competitively with the Civic, Focus, Elantra and others; the carbon fiber body panels will just be too expensive to produce. Also, those huge, aggressively designed wheels look great on the Corolla Furia Concept but we can pretty much guarantee that those big rollers wont be fitted on any showroom cars in the foreseeable future. The good news is that there are aspects of the Toyota Corolla Furia Concept that could make it through to production including the aggressive front and rear fascia, the low, sleek roofline, the short hood and trunk areas and with any luck, that longish wheelbase. The overall design of the Furia Concept would allow the next Corolla to offer a ton of interior space thanks to the massive wheelbase and short front/rear sections while the aggressive exterior design will most certainly help the Corolla appeal to the younger crowd who is currently attracted to the likes of the Focus, Cruze, Dart and Elantra. Realistically, I don’t think that the next Corolla will be quite as aggressively styled – especially in the front end with those thin multiunit LED headlight assemblies where we will likely see a more traditional single lens setup but if Toyota can produce a new Corolla that offers even a touch of the styling of the Furia – the next generation Corolla could be a huge hit in the US market and around the world. No more would the Corolla be the bland, boring option of the compact sedan class with this new aggressive styling direction but before we can applaud the company for building a Corolla that will really stand out in a crowd, they are going to have to actually build it. 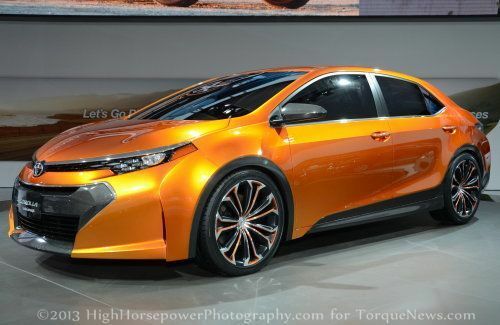 In the meantime, check out our gallery of the Toyota Corolla Furia Concept by clicking any of the thumbnails above on the right and stay tuned to TorqueNews for all of your auto industry news!